Festivals: There is a festival every weekend, in every corner of Toronto. Whether you're visiting the city or looking for something make sure you take a look at what's on. The festivals that we are most looking forward to checking out are the Redpath Waterfront Festival (June 22-24, 2018) where we hear the giant rubber duck of 2017 has been replaced by a giant beach ball pendulum and Toronto Buskerfest (August 31-September 3, 2018). Other options that never disapoint are the CNE, Salsa on St Clair and Taste of the Danforth. Swimming: In our post about Winter in Toronto we talked about the indoor pools but there are hundreds (literally) of outdoor splash pads, wading pools and swimming pools that are all free of charge! Splash pads are unsupervised and typically located within a park. They open May 20th meaning you don’t have to wait until school is out to beat the heat. They are also open long hours – from 9 a.m. – 8:30 p.m. weather permitting. There are 93 splash and spray pads in the city so there is probably one right around the corner from you! We found the water to be chilly for infants but older kids always seemed unfazed. Our favorites include: Stockyards (St Clair and Keele), Centre Island, Christie Pitts, Cedarvale Park, and Wychwood Barns (bonus, you can visit the farmer’s market at the same time!). We have also heard great things about Corktown Commons and Hendon Park (at Yonge and Finch). Swimming pools. There are 58 outdoor pools in Toronto, many of which have water slides, diving boards, shallow kiddie pools and accessible zero entry pools. Even with infants we spent most of our time at swimming pools where the water was more temperate and it was deep enough for the adults to get in as well. We spent most of our time at Alex Duff (Christie Pitts), Giovani Caboto (Earlscourt Park) and High Park. We’ve also heard great things about Monarch Park. ​Kidstown Water Park: This city run water park is free of charge. Located in the east end of the city and has a variety of water features, tipping buckets, a slide, wading pool and splash pad. We will definitely be checking it out this summer! Toronto Blue Jays: Check out our post called "Take me Out to The Blue Jays Game!" from earlier this year and enjoy an afternoon or evening out at the Rogers Centre! Parks: Toronto is a city within a park. While most people think about it as a concrete jungle there are actually 1500 parks and over 600 km of trails. 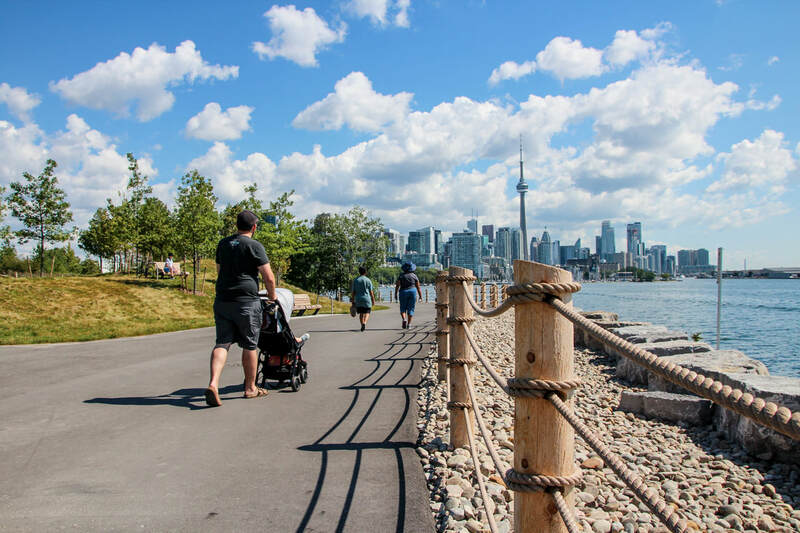 You can check out the city of Toronto website to find a park or walking trail in your area. Check out their list of 10 great playgrounds here. Below is one of our new favourites, Grange Park, located just behind the AGO it has amazing interactive play structures, fountains to play in and lots of green space to have a picnic or kick a ball around. Not to mention it has a great view and is walking distance from many of the downtown hotels and attractions! Farmer’s market: Saturday mornings are synonymous with farmer’s markets. There are bigger ones, like the ones found at St Lawrence Market and Evergreen Brickworks, as well as smaller community based ones like those found at Wychwood Barns and Withrow Park. Don’t forget about midweek farmer’s markets too like the ones at Dufferin Grove (Thursday afternoons) and in East York (Tuesday mornings). You can find a list of all the farmer's markets in Toronto here. Evergreen Brickworks: Not only does the Evergreen Brickworks, located at the foot of the Bayview extension, have a great farmer’s market but it backs onto the beautiful green space of the Don Valley. You can take guided tours of the trail system or wander around on your own. Our favourite place to hang out is definitely the children's garden! The Toronto Botanical Garden is a beautiful place to walk with lots of quiet paths that connect lawrence all the way south to Eglinton through Sunnybrook Park. There are also teaching gardens will keep your kids entertained as they touch and smell the plants and harvest the vegetables. High park: This 400 acres of green space right in the middle of the city has everything – picnic tables, trails, Grenadier pond, a swimming pool, splash pad, baseball diamonds, large open spaces to run, a zoo and the Jamie Bell adventure playground. Pack a lunch because you will want to spend the whole day here! Toronto Zoo: With so many baby animals born in the last year (lions, leopards, cheetahs, rhinos and more!) as well as a fantastic splash pad, this is another place we will be checking out this summer. Centre Island: After a very rainy spring Centre Island will be closed for a couple of weeks but when it opens again I highly recommend a visit. Taking the ferry over gives you a beautiful view of the skyline and once you’re on the Island you will forget that you’re in Canada’s biggest city! With no cars allowed it’s peaceful and quiet. You can take a swim in Lake Ontario, play in the Franklin kids playground or the splash pad, rent a bike and explore, visit the amusement park or play a round of frisbee golf. There are tons of great things to do year-round in Toronto so you will find lots of indoor fun that isn’t necessarily summer specific. Here’s just a few ideas that can keep your little ones entertained on those inevitably rainy days. Ontario Science Center: We just visited for the first time last month and found that this is truly a space that will entertain kids of every age! The Kidspark area is perfect for crawlers all the way up to age 8 and there are plenty of spaces for older kids to learn, create and be curious. ROM: If your kids are interested in animals or dinosaurs the ROM will blow their mind. The blue whale exhibit is on until September 4th and upstairs there is a great kids area with dress up clothes, lots of puzzles, books and opportunities for make believe. Head down on Sunday to take advantage of kid specific Family Funday activities. The ROM also runs day camps! Ripley’s Aquarium: We talked about Ripley’s in our Winter in Toronto post but there's no reason why you couldn't visit in the summer. Combine it with a trip up the CN tower and see what you can spot from the highest point in the city. Indoor play spaces: There are no shortage of inexpensive, and even free, indoor play spaces. Check out the Children’s Storefront, the Ontario Early Years Centres, and Oaks 'n Acorns. Some of these are only open during the week while others have drop in programs on the weekend as well. Insider tip: You can use your Toronto Public Library card to get family passes to many attractions including museums like the science center, ROM and AGO as well as Black Creek Pioneer Village and the Toronto Zoo. Check the Toronto Public Library website for which libraries carry the passes and when you can pick them up. There are limited quantities and people line up before the libraries open for the most popular passes!